When I visited friends in Moscow years ago, I learned that they call baked potatoes, jacket potatoes. I love that and I have been calling them that ever since. Personally, I bake my potatoes without tin foil, since there is nothing better than crispy potato skins! I learned how to make a version of cashew sour cream at my class at the Natural Gourmet Institute, but I have since simplified it. I always have a batch of plain, unseasoned cashew ricotta in the refrigerator. If this is going to be dinner, I take half a cup to make sour cream and save the rest for other recipes. Also, I don’t use oil because it is just as good without it and I am trying to decrease the amount of oil in our diet. I am posting my recipe and the original recipe too. Drain the cashews and with about 1/4 cup new water, blend in the blender until well combined. Pour into a strainer with a small mesh to drain the water. Use the cashew milk for shake-y shakes! Slice the scallion and mix with cashew puree with fresh lemon juice, brown rice vinegar, and a pinch of salt. Taste and adjust. Bake the potatoes until soft to the touch. 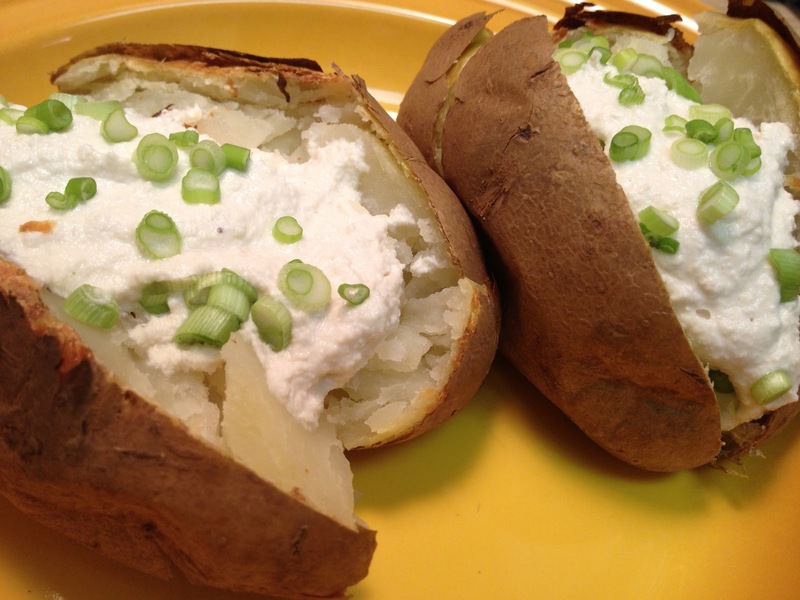 Split them open and top with cashew sour cream and the green part of the scallion. Enjoy! Or, you could put the cashews, 2 tablespoons of new water, the scallions, lemon juice and brown rice vinegar into the processor and process it right up. Add water, if necessary. And salt to taste. Combine all ingredients in the food processor until smooth and creamy.